The following outlines a place-based learning activity using geo-located blog posts aggregated to a course site. This activity has successfully been implemented by several interdisciplinary programs at The Evergreen State College for study abroad as well as regional field trip based activities. Have students create an individual travel/academic journal (blog). Provide guidelines for the structure and kind of content expected but ultimately this site belongs to the student; it is a personalized space for them to document their work. It’s often best to have them create the site with support before they leave. Build in practice by journaling about the preparations necessary to undertake the trip. Encourage the use of mobile devices to write, capture media and post to web-based journals the sights, sounds and experiences of their travels and study. Encourage the use of a consistent set of categories to help structure the writing and assignment expectations. This can also work to create consistency across all student work. If the faculty is traveling as well, create your own journal and set a good example of the kind of work you are looking for from your students. Geolocate each piece of writing or media to connect it to the place of study. Students will locate each post with the longitude and latitude using a map aware geo-blogging plugin. In WordPress there are a few geo-blogging plugins that work well, GeoMashup has been doing this successfully for quite awhile and connects easily to Google Maps. Aggregate student journals to a single class blog to connect the work and get the bigger picture. The class blog serves as a hub to easily view the posts of all students while providing easy navigation to each student’s individual blog site. A WordPress plugin that does this well is FeedWordPress. Additionally you can filter by category which works well if students all share a common set of post categories. In order for syndication to work, student blogs must be publicly viewable. Making academic work public encourages a conversation with your students about privacy, the possible use of nom du plume and what is appropriate content for an academic journal. Create a global map of posts to view ‘Where in the World’ all of this learning is taking place. 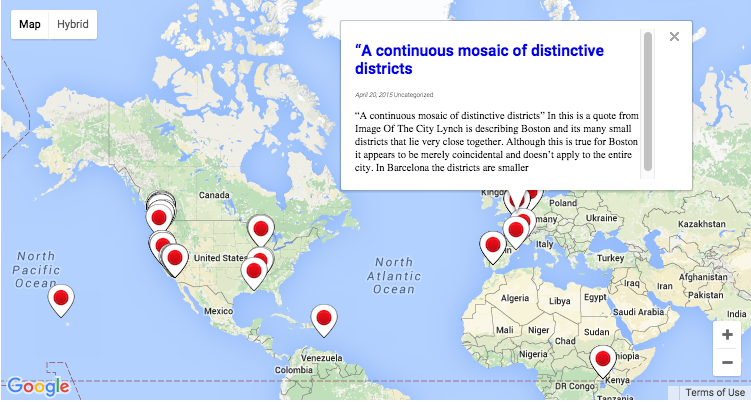 This map creates a geographical navigation that lets you view the combined journal work of students by location. Each map point pulls up the a student’s post excerpt. Clicking the post title takes you to the student’s individual journal. The following WordPress plugin cocktail does the trick: GeoMashup + FeedWordPress + FeedGeoMashup. Great question, Stan, nothing that I know of. My hope is that this strategy will inspire other EdTech folks to spin up WordPress installs with geolocation plugins for their students and faculty.